Sutlej-Yamuna Link Canal Controversy: What Should You Know? 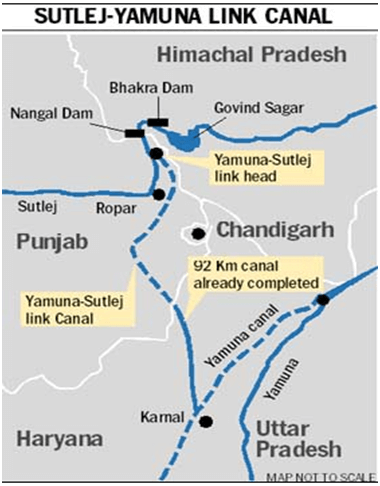 Sutlej-Yamuna Link Canal (SYL Canal) is a 214 km water way proposed to connect the Sutlej River in Punjab to Yamuna canal in Haryana. However there are lot of controversies in news about the project. This post analyses in detail, the issues connected with Sutlej-Yamuna Link Canal, stand taken by the governments involved, court observations etc. What should you know about Sutlej-Yamuna Link Canal? The proposed canal transfer water from Punjab to Haryana. 122 kilometre stretch of it falls under Punjab and the remaining 92 kilometre is in Haryana. It starts at Palla village, near Delhi. The canal though designed to carry a maximum of 10, 500 cusecs of water, will actually carry 6, 500 cusecs of water from Punjab to Haryana, as per an agreement of water sharing. The canal takes off from the tail of Anandpur Sahib Hydel Channel near Lohand Khad, a few miles away from Kiratpur Sahib in Ropar district and enters Haryana near Kapoori village in Patiala district. Besides water transfer, the canal will also cater to the irrigation needs of the agriculture based villages of Rupar and Patiala districts. Two hydel projects are also planned to generate power. Another major advantage is that the canal would make available shipping from India’s east coast to west coast, thus drastically reducing the freight related expenditure. The digging began in 1984. A major part of the canal was completed in the Punjab territory in 1990s itself, spending around 750 crores of rupees. Only a small part is left to be completed, which has a story for itself. The unattended canal, though, is almost in ruins now, with the brick lining peeling off at places, bushes invading the channel, causing floods and destruction in the rainy season. The canal comes under the Bakra- Baes Management Board, BBMB, constituted under the Punjab Reorganisation Act, 1966, which is a central legislation, (like the Andhra Pradesh Reorganisation act, creating Telangana). Following the Indus Water Treaty 1960, between India and Pakistan, India got the unrestricted right to use the waters of three rivers: Ravi, Beas and Sutlej. The waters were shared among Punjab, Delhi and Jammu & Kashmir. The history of the current dispute can be traced back to the mid-1960s, when the Punjab state was reorganised. On 1966 October 31, the state of Punjab was divided; and a new state of Haryana was created. Some parts were also transferred to Himachal Pradesh, then a Union territory, and the city of Chandigarh became a Union territory and served as the capital of both the residual Punjab and Haryana. When the state was bifurcated, the sharing of the river water also became a bone of contention. Being a successor state, Haryana had the eligibility to receive a share of Punjab’s waters. In 1976, the then Prime Minister Indira Gandhi brokered a deal to divide the water, such that each state received 3.5 million acre feet (MAF) of water. Also Rajasthan was to get 8 MAF and Delhi 0.20 MAF. But this deal was not furthered by the Punjab government of the time, following which Haryana approached the Supreme Court in 1979. Punjab also challenged this litigation. Needing a political solution rather than a judicial one, once again Indira Gandhi intervened and at her behest, Punjab withdrew its suit from the Supreme Court. But Shiromani Akali Dal, SAD continued to campaign against the canal. SAD’s Anandpur Sahib Resolution of 1973 had also condemned the canal. The foundation stone of the canal was laid on April 8, 1982, by the Prime Minister Indira Gandhi at Kapoori village, in Patiala. 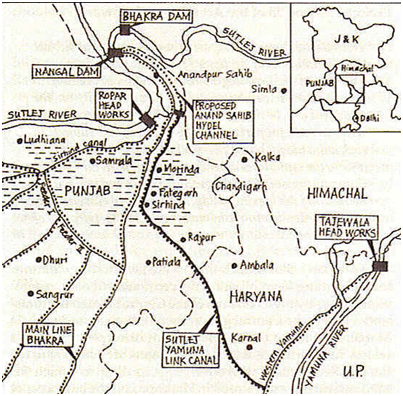 But the construction of the link canal had to be halted, following militancy in Punjab in the 1980s. The labourers working there were attacked, and two engineers were shot dead, the superintending engineer, and the chief engineer. another peace brokering was achieved as part of the Rajiv-Longowal Accord of 1985 (The Punjab Accord), but not with any lasting effect. A Tribunal under Justice V Balakrishna Eradi was also set up that year, to specify the quantum of Ravi-Baes waters (another dispute) to be shared among Punjab, Haryana and Rajasthan. Acting in 2002, the Supreme Court directed the Punjab government to continue digging for the project. Punjab state legislature refrained from its upper-riparian commitment and passed the ”Punjab Termination of Agreement Act, 2004″, whereby it sought to de-notify the land acquired for the project. The Act annuls the 1981 Indira Gandhi award and also subsequent agreements relating to the distribution of Ravi- Beas waters among Punjab, Haryana and Rajasthan. In 2004, the President of India, made a reference to the Supreme Court, (under the powers bestowed up on him by Article 143 of the Constitution), regarding the validity of this state law. In 2016 March only, the Supreme Court took up the matter for hearing. Meanwhile, adding fuel to the fire, the Punjab legislature passed another act, the Punjab Sutlej-Yamuna Link Canal (Rehabilitation and Re-vesting of Proprietary Rights) Bill 2016, which seeks to restore the land (around 5376 acres) acquired for the canal, back to the farmers free of cost. Even though, it is unlikely that the Governor will give assent to this bill, work has already been started by the frenzied land-owners to level the land and reclaim it, thus wilfully destructing the canal, on which hundreds of crores have already been spent. Presently, the Supreme Court has ordered status quo on the Bill. But even after that, the Punjab assembly has unanimously passed a resolution that the SYL canal cannot be allowed to be built. Punjab defends its act, stating that under Article 143, the Supreme Court has only advisory functions, and hence cannot pass an assumptive interim order. Water wars are the order of the day, nationally and internationally. We have seen it in Chinese plans for building dams across Brahmaputra, the conflict over the use of Nile waters etc. To their merit, the political leadership of Punjab, including current Chief Minister Parkash Singh Badal and former CM Amarinder Singh, have been asserting that the state has no surplus water to give to Haryana. Punjab also claims that the SYL award was based on the water flow statistics of 1920s; and now the situation is at variance to those figures. They also claim that Punjab needed more water than its younger brother, Haryana, owing to the pivotal role of surface irrigation in the state’s agricultural sector. Fingers also point to the flawed agricultural policy of the region including Punjab and Haryana, growing water intensive crops like wheat, rice, sugar cane etc. in an other-wise water scarce region. At a time when the Government at the centre aims to achieve co-operative federalism, to realise the dream of Team India, many states are moving in the wrong direction. Many ongoing disputes include the Cauvery water dispute among Tamil Nadu, Karnataka, Kerala and Puducherry; Mullaperiyar dispute between Tamil Nadu and Kerala; Mhadeyi dispute, the never ending Krishna and Godavari river water disputes etc. Currently, there is no established mechanism which has proved to be effective in amicably resolving the disputes. By our understanding and going through precedents, such a law is ultra-vires the constitution. We have seen it in the 2015 judgement on Mullaperiyar dam case. The Kerala legislature had passed an act to by-pass an adverse 2006 SC judgement on the dam. In 2015, SC declared the act to be ultra-vires. In the present SYL case though, an additional condition is that the SC is hearing the matter within the contours of article 143 of the constitution (regarding the Presidential reference). (1) If at any time, it appears to the President that a question of law or fact has arisen, or is likely to arise, which is of such a nature and of such public importance that it is expedient to obtain the opinion of the Supreme Court upon it, he may refer the question to that Court for consideration and the Court may, after such hearing as it thinks fit, report to the President its opinion thereon. (2) The President may, notwithstanding anything in … the proviso to Article 131 [Original jurisdiction of the Supreme Court], refer a dispute of the kind mentioned in the said proviso to the Supreme Court for opinion and the Supreme Court shall, after such hearing as it thinks fit, report to the President its opinion thereon. Such a report is only advisory in nature, which the President is free to follow or not to follow ( Keshav Singh case, 1975); and hence it cannot issue a binding order saying the state law is ultra-vires. If the Supreme Court indeed pronounces such a verdict, it would be venturing in to the unchartered waters for the first time. Further, Contempt of Court provisions, can also be invoked by the court against the Punjab assembly, for not heeding to its directive. As per the 7th constitutional amendment act, there is provision for a common Governor to two states. Currently there is a common governor for both states. Kaptan Singh Solanki is the current common governor. His predicament can be seen from the recent turn of events, when he had to first speak in favour of the Punjab assembly’s stand and then in a week’s time, favour Haryana’s stand while addressing its Assembly session! He has so far not given his assent to the Punjab bill, and is likely to refer to the President. The SYL issue was referred to the Supreme Court, under Article 143, in 2004. Under Article 143 (1), it is discretionary for the Supreme Court to answer or not to answer the questions put to it (held so in Kerala Education Bill case, 1957). But for those references under 143 (2), it is bound to give advice. Here it is under Article 143 (1) only. Also there is no time limit mentioned for disposing off the request. In this case, the court took 12 years to take up the matter. 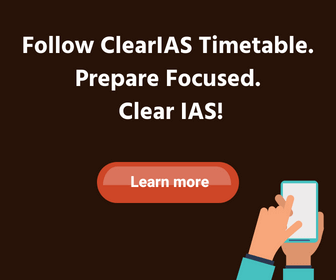 There are suggestions that there must be proper time limit prescribed for such references. The Central government has its role cut-out, to resolve the issue before it assumes gigantic proportions. The fact that, one of the contending states is going for elections in the near future, adds political overtone to the already complex situation. The issue needs a political solution, as even Supreme Court appears to be in a dilemma. It is time for the leaders to show wisdom and non-partisanship, giving due credits to the claims of all contending parties involved. 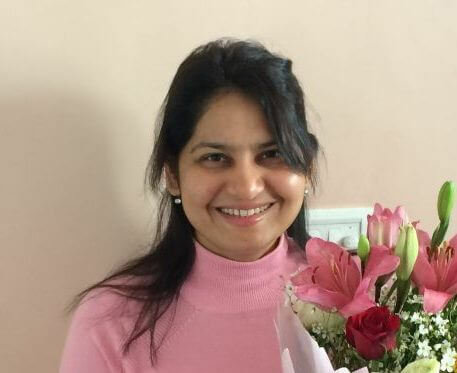 @Vikas: Updated the post. Thanks for writing to us. V.P.Singh Badnore is the governor of Punjab right now. Thanks for the information. Hope everythings end fine at last in favour of Nation Building. You need to put the stand taken by Punjab comes from the fact that Haryana and Rajasthan are non-riverine states of Satluj that is why punjab politicians go about trumpeting the natural law of justice. And with ground water levels droping too 300ft and below, due to paddy cultivation cycle in punjab for which it does not have suitable climate it is no more an emotive issue for a lot of people there but a matter of survival. Rest of article is very well compiled, i havent come across more informative article on SYL anywhere.